This is a story about how a simple cup of tea can bring people together and perhaps even get us to think more intently about the way money defines – and sometimes distracts us from – personal relationships. Guisepi Spadafora has been roaming the country in a repurposed school bus, hosting free tea parties for strangers. 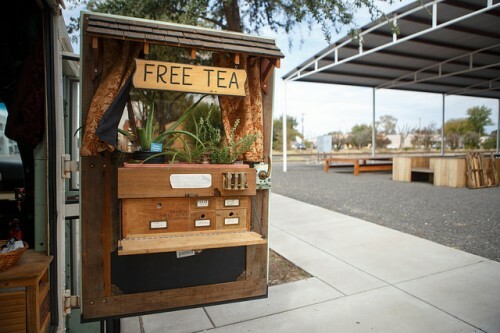 He passed through Marfa on his travels, offering free tea to friends and acquaintances alike. KRTS interns Ian Lewis and Mia Warren sat down for a cup. “We’ve got all kinds of actual teas – green, black, white, oolong, herbal teas, medicinal teas,” Guisepi says on a chilly afternoon, as dark clouds threaten rain. He’s 31 years old, wearing a green vest, newsboy cap, and jeans. As soon as we step onto the bus, he bustles around, preparing the kettle. 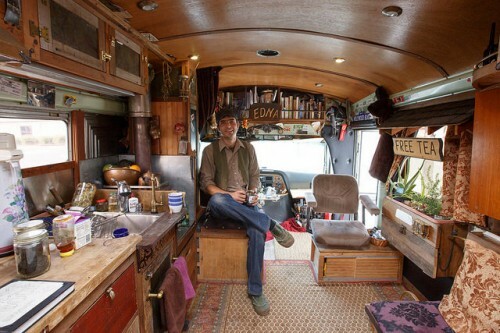 Originally from Friday Harbor, Washington, Guisepi’s been on the road for the past six years, living in a converted school bus and serving tea to strangers, all for free. He wants to show everyone that strangers can meet, converse and help each other – without anything being bought or sold. A jack-of-all-trades, Guisepi often works small jobs wherever he goes. 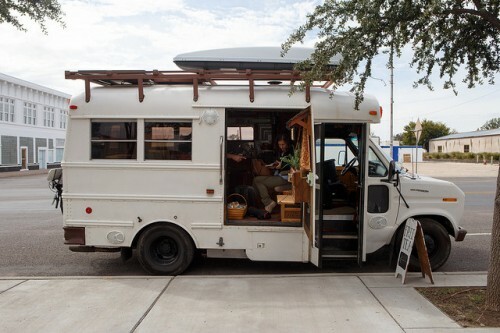 In Marfa, he fixed a water heater and repaired an old Mercedes. In return, he’s usually offered a place to park, hot meals and sometimes money. These interactions all start over tea, given to Guisepi by farmers and companies supporting his mission. But it’s not just tea being given away. “This is my gift and take area,” Guisepi says, indicating a window ledge, where he’s installed a row of wooden drawers. Each is full of all sorts of things left by his visitors. Anyone can leave or take whatever they want. One drawer is full of cards offering various services – 15 minutes free legal consultation, a free haircut. 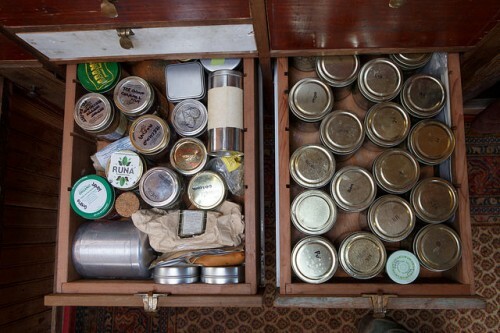 There’s another a drawer, stuffed with bills and coins. “People say, ‘Wait, I can come to your bus, I can get free tea and free money?’ I say, ‘Yeah, of course,'” says Guisepi. This project began almost a decade ago, when Guisepi found himself feeling lonely. He’d just moved to Los Angeles and was living in his pickup truck. “It’s one of those things where you move to a new city and you don’t know anyone and you’re working very hard, and there’s some sort of disconnect,” he recalls. Craving conversation, he’d drive down to Hollywood Boulevard after work to cook dinner on his tailgate. Strangers passed by. Often they’d talk and have dinner together. To keep the conversations going, he started brewing tea. “And I had all kinds of people. Gutter punks, street kids, thugged-out dudes from South Central, TV producers, college students, whatever. I mean the whole array, all sitting there together,” he remembers. Guisepi decided he wanted to reach more people. But he needed a way to get around. “Edna Lu is a Ford Econoline van with a Thomas school bus body,” says Guisepi. After buying the vehicle on Craigslist, Guisepi converted it to run on waste vegetable oil. He installed a solar panel to power the electrical system, a small wood stove for heat and a propane stove for boiling water. 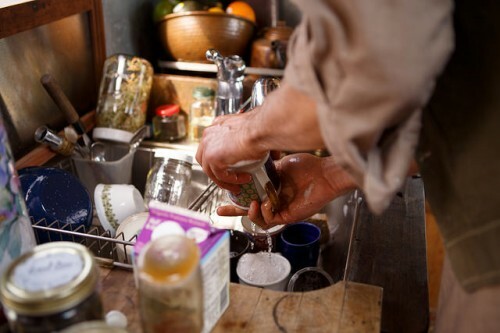 He’s also transformed the interior into a cozy tea house. A year and a half ago, Guisepi left his home state of Washington and set out to wander across the United States. Today he’s parked on the main street in town. The doors of the bus are open. Soon, a medical student named Petra Kelsey stops by for a cup of tea. “It’s so good that I’m like ten minutes late for work, and I really want to finish it,” she says. People can see Guisepi’s kindness and willingness to help others is genuine. And more often than not, these feelings spread to his guests. Before Kelsey leaves, she offers Guisepi her phone number. “If you ever need medical advice. I don’t care how many years from now,” she says. Monetary transactions are at the core of modern society. But the way most of us work and live is not the only way. For years now, Guisepi has sustained his lifestyle, all by brewing a fresh pot of tea and opening his doors to the public. This entry was posted in KRTS News and tagged culture, free tea, guisepi spadafora, money, relationships, society, sustainable living. Bookmark the permalink.